An undated photo of Ernest Kucera, the leader of the Ernest Kucera Polka Orchestra. Kucera died Monday at 86. For more than 50 years, Kucera led a polka band that played in Southeast Nebraska and around the world. He died Monday at the age of 87. 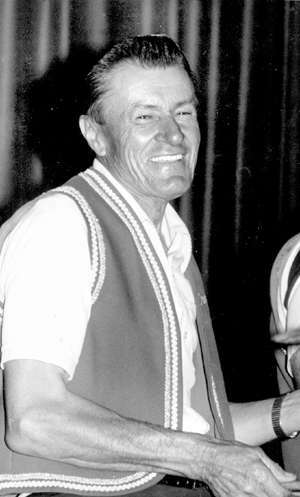 Nebraska had a King of Polka, and his name was Ernie Kucera. For more than 50 years, Kucera led a band that played wedding dances and anniversary dances and the annual Bee Barn Dance — the one where the fire department raffles off live poultry. He toured Texas and Oklahoma and Michigan and even communist Czechoslovakia. He had his own radio show, which aired daily for more than 40 years. “People used to call him — and he was — the Guy Lombardo of polka music,” said Michael Brecka, who played in Kucera’s band for years. Kucera’s body was found late Monday afternoon in Homestead Lake, about two miles from his home in Abie. Kucera, 87, had been seen fishing earlier that afternoon. Butler County Sheriff Mark Hecker said it appeared Kucera died before falling into the lake, possibly from a heart attack. Kucera’s wife, Millie, died in a car accident in October. Monday would have been her 90th birthday. By Tuesday, news of Kucera’s death had spread throughout the polka community, in which he was viewed as both a mentor and a legend. Brecka said he started dreaming of playing with Kucera around his 12th or 14th birthday, when he received an Ernie Kucera album as a gift from his dad. Brecka started playing the trumpet, and by the time he was in his 20s, he had a band of his own. But then Brecka heard that Kucera, who farmed the land next to his father’s, was looking for a new trumpet player. He was, and he did. Brecka remembered Kucera as a good boss who treated his musicians well, paying them before he paid himself. He was a good musician, too, Brecka said — precise and clean, with a distinctive, simple beat that was easy to dance to. For those reasons, Kucera’s band was booked most Saturday and Sunday nights, and a lot of Friday nights, too, Brecka said. Plus it went on tour four or five times a year. The best times, Brecka said, were in Texas, where people would line up 20 feet deep in front of the stage to watch the band play. “Ernie Kucera was Texas’ Elvis Presley,” Brecka said. In Southeast Nebraska, of course, Kucera was just as well-known. His polkas and waltzes remain popular requests on KJSK in Columbus, where Mark Vyhlidal hosts a polka music program each Sunday. Vyhlidal, himself a band leader, remembers watching Kucera play when he was still a little boy. Kucera gave many polka musicians their first jobs, said Mike Siroky, his grandson. Kucera got his start playing in his brother’s band in 1938. But the war broke out, and many of the players were drafted. In 1942, Kucera took over as band leader and began looking for new members, often recruiting kids still in high school, Siroky said. In one often-repeated story, Kucera asked someone where he could find a piano player. He was told to chase down a kid riding past on his bicycle. He did, Siroky said, and the kid on the bicycle went on to play with Kucera for years. He continued to give young musicians a chance, said Lonnie Piitz, who now leads the Leo Lonnie Orchestra. Piitz, whose uncle Leonard was in Kucera’s band for 50 years, played a show in Grand Island with Kucera when he was just a seventh-grader. It was Kucera’s reputation as a great musician that made joining him onstage so exciting, Piitz said. During the 1950s, KOOO radio in Omaha dubbed Kucera’s band the No. 1 polka band. The name stuck, and Kucera’s official band name was changed to Ernie Kucera and His Orchestra — Nebraska’s No. 1 Polka Band. In 1979, Kucera was named the Polka King at Peony Park, and that name stuck, too. In 1982, Kucera and his orchestra took a 12-day tour of Czechoslovakia, becoming the first American polka orchestra to play in the then-communist country. Kucera was inducted into the International Polka Association Hall of Fame in 1992 and was a member of the Sokol Hall of Fame. He released 12 albums before retiring in 1995. Brecka, who took over Kucera’s band after he retired, said he would continue to play the famous arrangements as long as the crowds kept coming. Vyhlidal will keep playing Kucera’s polkas and waltzes on his weekly radio show. Funeral services for Kucera will be at 11 a.m. Friday at the Abie Auditorium. Visitation will be Thursday from noon to 8 p.m., with the family present from 6 to 8 p.m., at Kracl Funeral Home's David City chapel. Reach Cara Pesek at 473-7361 or cpesek@journalstar.com. David City Banner Press Editor Larry Peirce contributed to this report.